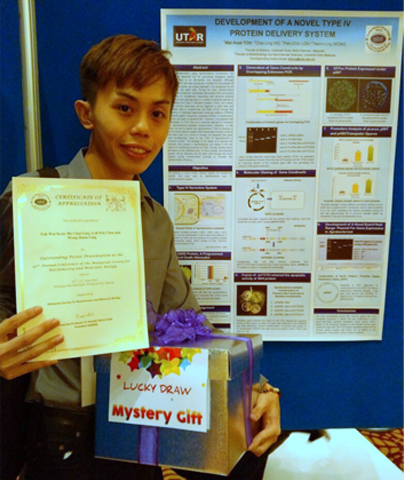 UTAR Faculty of Science postgraduate student Toh Wai Keat clinched the Best Poster Award in the 40th Annual Conference of the Malaysian Society for Biochemistry and Molecular Biology (MSBMB) held at Putrajaya Marriott Hotel from 10 to 11 June 2015. Toh, a Master of Science student won the Best Poster Award for his research titled, ‘Development of A Novel Type IV Protein Delivery System’ and received a certificate of achievement. His research aimed at addressing how to develop a novel protein delivery system for transferring protein into plant cells by using Agrobacterium tumefaciens type IV protein secretion system. The plants’ transformation using Agrobacterium tumefaciens has become an essential tool for generating transgenic plants nowadays due to its affordability and simplicity. Organised by MSBMB, the 40th Annual Conference aimed to bring together researchers from different disciplines related to biochemistry, molecular biology and bioinformatics to deliberate and investigate exciting new research findings and exchange ideas and information, with the prospect of new partnerships, collaborations and joint projects.